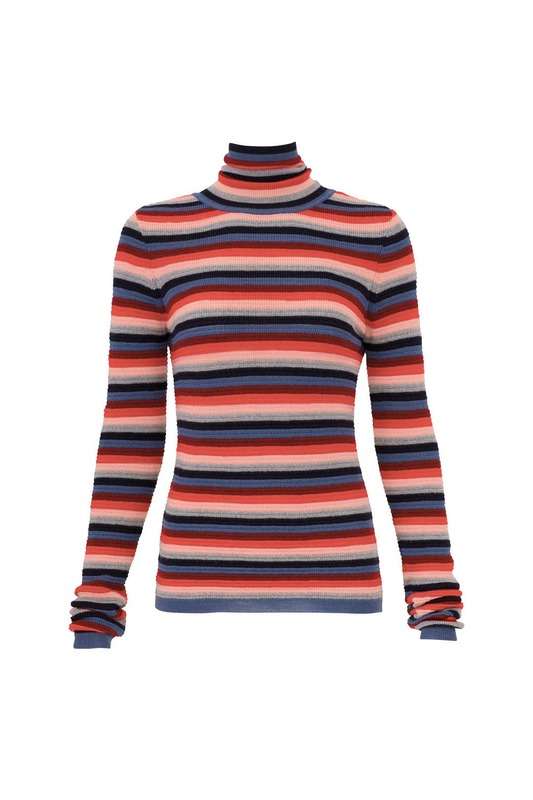 Multicolored stripes draw the eye to this sleek, slim-fitting turtleneck by M.i.h. Jeans. Style it with the Navy Belay Tote by ZAC Zac Posen. This sweater runs true to size. We recommend going one size up for backup (see following fit notes for exceptions). You can size up, or wear regular size! 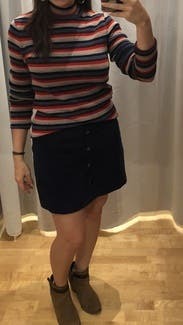 Found medium in the store, tried on and it looked cute! Could have definitely worn small also, but it wasn't available. Cute, fun, retro, a little bit itchy though. It was too itchy and the fabric was uncomfortable to wear. The neck was ridiculously small too. I did not wear it. Usually I wear a small, but the medium worked well with the pants that I chose. Tight around the neck. Size down. Lots of extra fabric! Especially in the back of it? Wore to work and rec. nice compliments. Fun to brighten up the office with it. Paired with RTR yellow bomber/varsity jacket. 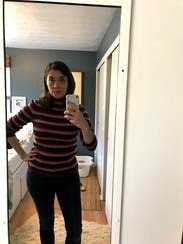 FYI, the actual turtleneck is very high but not uncomfortable. 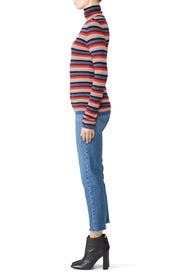 Who has arms this long? 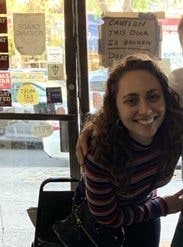 Super cute but overall weird fit, large in shoulders and arm length was inexplicably long. Like Matthew Mcconaughey long arms. I folded them underneath but ended up returning after one wear. 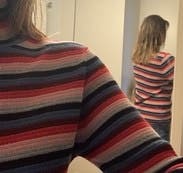 Cute sweater with not too tight a fit - nice retro 70's vibe and comfy. The sleeves are weirdly long, so you need to bunch them up by your wrists. Currently wearing this right now. It is SO cozy for a fall day in Maine! Its a LITTLE itchy at the turtle neck, but I think that is just me because it doesn't feel itchy anywhere else - I think I just need to remember to moisturize my neck haha. The turtle neck part is tight - so be aware! But it looks good! 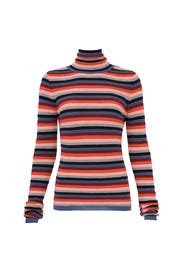 I am currently wearing it with a navy leather skirt, navy tights and brown boots for work. It was brand new when I got it - tags and all! 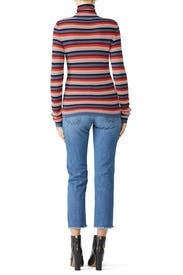 I love all the colorful stripes I've paired this with rose color skinny jeans, black jeans and dark blue cordories. The turtleneck part is a bit itchy when you first put it on but after a few minutes I didn't notice it anymore. 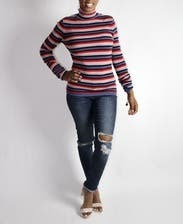 I love this colorful top by M.i.h. Jeans! It runs true to size so we suggest sizing up for your back up.This style is fitted but not too tight. The stretchy fabric allows comfortable fit throughout mid section. Its great for any cup size and can be worn with a standard bra. Pair with jeans and boots to complete this look. It's very warm, and a tiny bit itchy, but I got used to it and ended up loving this top. The fit was perfect. 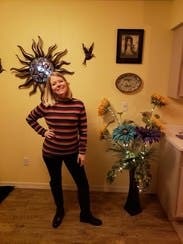 I get nervous in stripes as I have a big bust. But this shirt was perfect for my weekend getaway in Canada! I felt so stylish and put together. Paired perfect with a belt and hoop earings!